Posted on July 30, 2013, in School Assignments and tagged Doctor Who, Dr. Who, funny, funny kids, funny kids writing, funny test answers, funny writing, Humor, kid writing, school writing assignments, Stuff Kids Write. Bookmark the permalink. 16 Comments. Epic awesomeness right there and I don’t even follow Dr. Who. 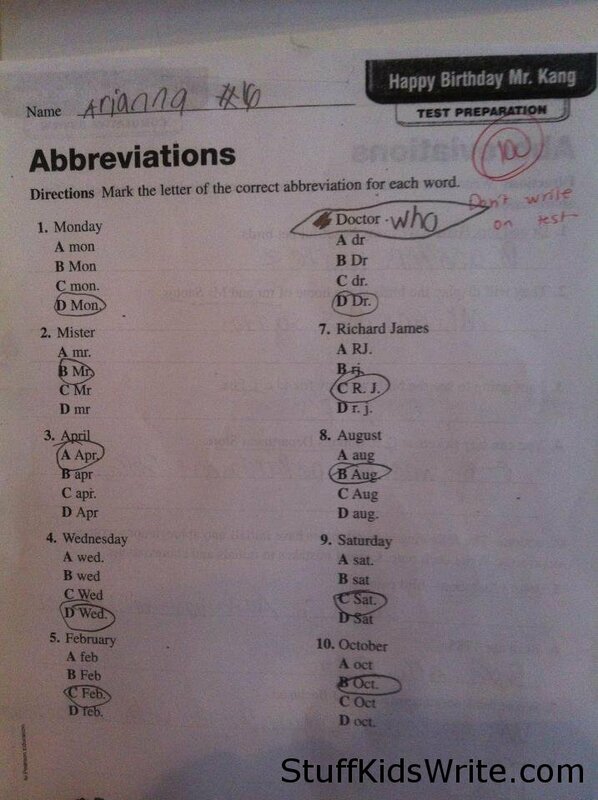 Nice that the teacher didn’t dock him for writing on the test. “Don’t write on test” – give me a break! This was creative and funny – teacher should be thrilled it wasn’t a crude drawing. This is our daughters and my husband and I thought this was hilarious! We framed it and he put it up at work. I agree with Escaping Elegance. How big of a jerk is the teacher in this scenario? The kid, on the other hand, is totally epic. Well played, Arianna. This was so cute. It has restored my faith in the next generation of Doctor Who Fans! This made my day. Brilliant. Changed the dynamic of a single piece of paper with one word. Should have got a extra mark! Ha brilliant. Always writing on their tests.